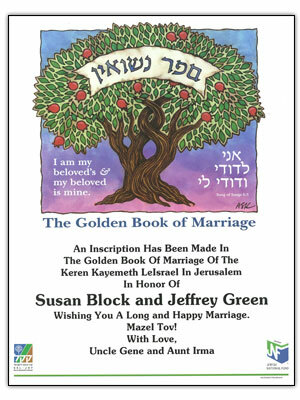 In commemoration of a marriage or anniversary, JNF’s Golden Book of Marriage Certificate makes the perfect gift. Express your feelings and love for the land of Israel with a personal message. Includes an inscription in the Golden Book of Marriage (Sefer Nissuin) in Jerusalem. Your gift is sure to be memorable. The artwork created for the Book of Marriage certificate was donated by illustrator April Stewart Klausner. For over 25 years, April has created original art for everything from books to websites, advertising to textiles, schools to theater. Her Judaic artwork, whether commissioned to celebrate lifecycle events or for private collections, is her true passion. Please complete the following information with regard to the person you wish to honor. Tributee Name (Please include Full Name) is limited to a maximum of 50 characters including spaces. Enter your message is limited to a maximum of 80 characters including spaces. Signer is limited to a maximum of 120 characters including spaces.